Marylou: Hi, everyone. It’s Marylou Tyler. This week’s guest is Steve Hall. He is Australia’s leading C Level Sales Authority, and he says he’s never been challenged on that, so we’re going to go with that. Steve is an expert on that bullseye that we know about, that center of the bullseye, starting conversations with the decision maker, and getting to the point where they are salivating about wanting to have further conversations with us in order to find out if there’s a good fit, and how we go about working together. He’s also working on another project which I’m going to ask him about later called the Executive Sales Forum International. For those of you, if that’s piqued your interest which it did mine, time permitting, I’ll ask Steve to talk about it. If we don’t have time, we’ll put all the information on his page, so that if you’re interested in that forum, contact Steve and he will get you all dialed-in and set-up. Welcome, Steve, to the podcast. Steve: Welcome from a sticky Sydney. Marylou: Oh, Steve. That’s right. It’s summer there. Steve: It is. We have the air conditioning on but at the moment it is quite warm. Marylou: Oh, wow. You have shorts on and a Hawaiian top or something, right? Steve: I actually have on shorts and a Tour de France t-shirt. Marylou: There you go. Very good. I saw in your LinkedIn profile that you listed yourself as one of the many things that you do well, storyteller. I am really excited about storytelling. As I told you offline, I met the author of Seven Stories Every Salesperson Should Know. We can talk a little bit about that, but I really got interested in how the heck do we pull together an intriguing, engaging, memorable story at the top of funnel when we’re just starting to introduce ourselves into an account. You’re gonna take us through the decision maker—how you get in, what you need to say, how you prepare and all that. My question to you upfront is do you also use story in order to start the conversation with your decision makers? Steve: The answer’s simple: yes. I must say, by the way, that Mike Adams’ book is excellent and Mike’s a really nice guy. Marylou: Our folks have gotten his information from the podcast a couple weeks ago. For those of you who don’t remember, go back a couple of episodes, and you’ll be able to see Mike’s book. Steve: For a second, let’s look at the prospect we’re talking to. Let’s assume we’re trying to get through to a company and the C level executives in that company and look at their lives, the important people they’ve got. We’re not just competing with our competitors to speak. We’re competing with anyone who wants a slice of their time: their boards, their shareholders, their peers, their reports, their customers, their suppliers, and anyone else that want to sell them anything. There’s an awful lot of people competing with their time. The first question is why should they waste their time even talking to you in the first place or even reading your emails? In order to get them to do that, you need a story, and the story might just be—I’ll call it a value proposition. I’m a big fan of a lot of value propositions—but you need a reason to get them to talk to you rather than somebody else. That’s a story even if it’s only a few words. Does that make sense? Steve: Well, you can tell a story in a very few words. I don’t know if you know Al Stewart who’s an English singer but who actually lives in California. One of his songs, he tells a story in five words: bar conversation, animation, anticipation, disinformation. There’s an entire story in five words. You can do it, but you need to think. I’ll give you an example. About six years ago in Haven, Australia someone approached us and said, “Look, we’re with digital agency. We’re really good once we get to speak to senior executives, but we’re not very good at getting to see them. They’re just too busy. Can you help us?” We said, “Yes, okay. Who’s your target audience?” They said, “Well, really we can do anything for anyone.” I said, “Well, that’s not terribly useful because we need to focus on someone, so is there any particular industry you have credibility in? and they said, “Yeah, we’ve got quite a few customers in retail.” I said, “Okay, great. What do you do for them?” “Well, we can do anything.” But if I go to someone and say, “I can do anything,” it’s not going to really cut through. Let’s look at retail, they chose an audience. What’s the biggest problem retailers have got that you can help them with? Now at that time—not right now—but at that time there’s a huge furor in Australia about international competition from online retailers. We created a message which was essentially a very short story, and that message was, “We want to talk to you. We’ve got a guy, Simon Van Wyk, he’s a digital expert, and we want to schedule a meeting between you and him to talk about helping you compete better with online retailers.” We reached out to various retailers, and we got meetings with I think 35 C level executives out of 90 retailers we approached. That was a very simple short story about what we wanted to do. It’s about something they cared about. Incidentally, what I just did, of course, was tell you a story about a story. Steve: There was a degree of that. He wasn’t internationally or nationally famous, but he was well-known. If you looked him up, you will find him. The thing is, you use what you’ve got and what we have with him was someone that had a degree of profile. If he hadn’t, we wouldn’t have done it that way, but because he did, that’s what we used. There’s a combination of things you use when you’re building a story. One is the audience. Who is your audience? What do they care about? How do we use a story that hits the buttons they care about? And then as yourselves and the thing that you want to talk about and how can we—I hate the word pitch—how can we pitch what we want to talk about in a way that resonates with that particular person? Steve: First of all, you got to work out what your objective. What do we want? Your first objective is to get enough of their attention so you can tell them the longer story. Again, I don’t like this argument about which is best, cold calling or social media because to me, their all channels to get our message across. But whether you’re doing it via LinkedIn or email or a phone conversation or via referral, what’s your first objective? Your first objective is to get enough of their time to tell your story properly. I don’t know if you sail, I don’t, but I know that if you’re on a boat and you want to get a hawser, you know one of those really thick ropes they use on boats to tie them up? Steve: If you want to get a line between two boats, you can’t throw the line across, you’ve got to send it across to the […], it’s too heavy. You send it across a rock or a stern, tied to a bit of string which is tied to a bit of rope, and then you pull in the hawser. It’s the same with storytelling. You have more story, which gets their attention enough to tell another story, and then the stories get more detailed, more involved, and you pull them in more, show them how you can help them more. Does that make any sense? Marylou: It does. I have a question about that. We had a book here a few years ago called, I think it was Resonate by Nancy Duarte. She focused on there has to be a juxtaposition in your story. What is, what could be, a contrast to jolt somebody? Do you agree with that concept? Steve: I haven’t come across it before. But it makes a degree of sense. A lot of stories—a lot of comedy as well—but a lot of stories depend upon that unexpected turn, but again, I think it depends on the stage that you’re at. I mean, Mike talks about seven stories of different stages of the sales process. If we’re talking top of funnel, and getting people’s attention, and getting them to want to know more, then there’s a limit on how much time we’ve got to tell that story. It’s going to be a pretty short story. Marylou: Short story but with an imbalance built into it of some sort. Otherwise, this is a story and, “Oh, that was a nice story.” But there has to be some sort of actionable piece to it to get people to jolt them from complacency into wanting to act. Steve: Well, it’s a question of giving to want to know more. It’s not unlike a newspaper headline. In fact, it’s very much like a newspaper headline. A newspaper headline is designed to grab your attention and makes you want to read the story. 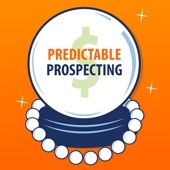 A prospecting story should make them want to know more and therefore agree to your 20-minute meeting or your longer phone conversation, or whatever it is. You need to generate curiosity but it needs to be curiosity about something that they care about. The precursor to that is you need to know what they care about and know what they don’t care about and that’s your product and service. Marylou: Exactly, features. Product features it does all these things. Steve: Or even benefits. When you’re talking features and then benefits, sure if you got this great product that has all these great benefits, that’s wonderful, but how do you know which benefit is relative to that particular person in the current circumstances? Let me give you an example. Just supposing you’re a company whose sales are down or whose profits are down. You were making 10% profit and now you’re making a loss. That’s a big problem, right? Steve: How many different ways are there that you can solve that problem? Literally hundreds of ways. You can sack people, you can hire more salespeople, you can do some training, you can buy some software, you can do a whole heap of different things to solve that problem. You got to be able to find the problem without just throwing benefits. If the benefits you’re talking about is improving customer engagement, that might be a total disconnect with what they care about at the moment. If you just start with what they care about and work from there. I’m talking now about selling executive level because if you’re selling to a mass audience, if you’re reaching out to a hundred or a thousand or a million companies, you can’t necessarily do that. But if you’re focusing on a small number of large, strategic targets, you can spend the time to work out what they care about most and then focus on that and how you can help them achieve that. Marylou: Okay, what we’re talking about then—correct me if I’m wrong—because we’re selling to a smaller audience, we’re going to take the time to hyper personalize, if you will for a lack of a better term, this conversation, for this particular person, at this particular moment in time, with these particular things that he or she cares about as a person, not a representative of people like him or her, this person. Steve: Yes and it’s a combination. We know that CEOs care about certain things, profit, risk, et cetera. We know that certain industries got certain issues like the retail industry that I was talking about a minute ago. We know that individual companies have individual problems based upon their personal circumstances. It’s a combination of those that gets the message. We know that if we’re talking to just people in a particular industry, these are the things they’re likely to care about. When we find it, based upon our research, if you’re targeting specific large value customers, if you’re targeting an industry as a whole, you can do what I talked about originally with that retail message, you can come up with an industry message. If you’re targeting an individual company, you will find it based upon what the research on that company, and if we’re targeting an individual person with that company, you can refine it further. Marylou: Okay. Now, when you’re getting ready for this, the planning process, on average are you leveraging technology to help you find these nuggets of information that are unique to the industry, the audience, the company, the person? Or are we still looking and researching online, reading, downloading, and trying to figure out what that nugget is? What do you typically use as your recipe for gathering this type of information? Steve: I haven’t yet come across any technology that can do that, or […] against technology but I think that a lot of AI-type technology tends to look at averages and trends, which is good. If you can do that, that gives you a good start but the refinement I talked about, I think has to be done by research and using your imagination. Marylou: Expand on the ‘using your imagination’ part. I’m interested to hear what that is. Steve: Einstein came up with the theories that created—among other things—the atomic bomb and nuclear power—by imagining riding on a light wave, wondering what it looked like. I’ll say to myself, if I was that person in that circumstance, what would I care about? Now having said that, there’s a lot of things that can help you. An annual report will tell you an awful lot about what their strategic priorities are. Again, I’m talking about approaching people at a fairly high level in the organization because again, at different levels of an organization, people care about different things. If you’re implementing a CRM, for instance, the thing that the CEO wants to get out of the CRM will be different from marketing and sales, and from the individual sales people who have to use it. Marylou: Right. I know that you were say before about the value profit. That term is a little bit overused or not defined properly but we use that term, unique value proposition, in order to uncover the daily tasks that our point person—whoever it is, whether it’s in that bullseye, the decision maker, whether it’s a direct influencer, next level out—we’re looking at their day-to-day life. We put ourselves in their shoes, walking through, what they do, what they’re concerned about, what task they perform, and looking for those gaps of what they’re doing now and how it can be improved or enhanced by putting a product like ours in. We’re looking for the time wasters, the pains, but also the gains that they can get either socially or functionally within the organization or strategically, and now we have this list of potential story topics that we could talk about. Steve: That’s very well put but that’s different to the traditional value proposition, which is our value proposition is X and you must love it. Steve: We’re talking the same thing, aren’t we? I mean, value is in the eye of the beholder. You’re talking about exploring what the value is to those people that you are talking to. That, to me is the way to do it. Even though my specialty is talking to executive level, that doesn’t mean you ignore the what I rather disrespectfully call them minions, but the minions you need to talk to as well. One thing you don’t want to do is to spend a lot of time working in the middle of an organization, [00:28:15] up report, and the same what people want, putting a lot of time and effort, only to have the C level people say, “We don’t care about that. Go away.” You also, when you go in directly at C level, you managed to get to speak to a senior executive and they love what you do, at some stage they’re going to pass you off to people underneath and say, “Okay, check them out,” and if they say, “I never heard of these,” or “Doesn’t fit our policy,” they can kill it dead, too. So you need to kill at both levels. Marylou: Yes. Let’s talk about that for a moment. I am sure you are aware that in the States, especially, we separate out in some companies the sales roles. We have business development teams who’s tasked with starting conversations and getting to a first meeting in some cases, or doing some level of qualification to help determine whether we should be spending time with the prospect, the prospect should be spending time with us. Typically, this is a junior position. What are your thoughts on those poor kids that are coming right out of college, given a list where they’re to target CEOs, CFOs, COOs of companies? Steve: Actually, I co-wrote an article on this topic a while back with a client of mine. As I’ve mentioned before, I look at things from the perspective of the prospect. If you’re a senior executive, how keen are you that some spotty kid out of school to call you and qualify you and see if you’re big enough fish to keep or whether you’re going to be thrown back or not? Especially if there were 10,000 doing everyday? I think the Junior SDR model is disrespectful, it doesn’t work, it burns through those junior sales people, it annoys the prospects, and it’s a curse on the industry. Is that loud enough? Marylou: Loud and clear, Steve. Steve: As I said, if I’m a CEO and I pick the phone and someone’s trying to qualify me, am I a decision-maker? Have I got a budget? Have I got a need? Pardon my French but, push off. Why would I take those calls and less and less people are taking those calls. More and more people are using voice mail, gatekeepers—which I hate that word, too—they’re not reading their emails. The volume of rubbish that’s trying to get through to senior decision makers is swallowing up everyone. Marylou: What does the ideal sales executive look like in terms of being ready to have these conversations? Is it a 10 year thing? Is it a product knowledge thing? Is it sales skills, mindset, or a combination of the above? Steve: The most important thing is an understanding of the challenges that the prospect has, the implications and consequences, not with how you can help them solve them but that you can help them solve. In a first conversation, you don’t get to how we fix it. It should be, “I know you’ve got this problem, I know that these are the implications of this problem, and we can help you fix it. Let’s talk further.” No one wants to know how you can do something until they believe you can do it. Does that makes sense? Marylou: It makes perfect sense. There’s a constant battle that I’m facing with clients about the level of product knowledge that we truly need to open doors and to get in the door. I’ve always pushed for the business case knowledge. Being able to have the conversations in the language of the person that your prospecting to, belly-to-belly, over the phone, whatever you’re doing, but having an understanding. Like you said, the challenge is being able to language those challenges in their language, the way they speak. And then also pushing up a bit about the implications if they did nothing, if they sat on the fence, and feeling the confidence, the competence to have those conversations because you’re going to eventually turn them over and get them introduced into the people who can get into the bits and bites of the product. But it’s a tough thing to convince people that really, we need to focus on the business issues, have a high level of product knowledge, but you don’t need to go deep, deep into the weeds to have these conversations especially the higher up you go. Steve: Well, I’m going to go now, Marylou, because you’re stealing all my thunder. Marylou: But how do you get that across, Steve? That’s your expertise is how do you act as a change agent, change the minds of these sales managers that they don’t need to do that, that we should focus elsewhere? Steve: It’s actually quite simple. Just ask them a question. How do you feel when a junior person somewhat try to sell you stuff and knows nothing of it, is trying to push that product on you, without knowing anything about your challenges? Do you take calls from SDRs, from business development people? Do you buy stuff from people who call you up and say, “Hey we got this great list of prospects. Do you want to buy off us?” I guarantee they don’t. They want people to do to others what they want have done to them. Marylou: Exactly, I hear you but it gets lost in the translation. We all know what we should be doing but to actually do it and actually focus on how to get better at doing it, is a mystery. Steve: There’s an article on my LinkedIn page about The Terrible Truth About Your Prospects. Or is it The Terrifying Truth? The Terrifying Truth About Your Prospects. The basic message is there’s two terrifying truths about your prospects. One is, they’re just like you, and two is, they don’t care about you, they care about themselves. They don’t care about your new premises, your brand new project, the number of customers you’ve got, your white papers, your case studies, they don’t care about any of those things. They care about their own premises and white papers and customers and prospects. If you want to talk to them, you’ve got to talk to them about what they care about. We’re going back to Dale Carnegie in the 1920s and 1930s talk about the other person, not yourself. Marylou: Right, How To Win Friends And Influence People. Still on my bookshelf. Marylou: Oh, wonderful book. Well, we’re running out of time here. I could talk to you all day, Steve, but I wanted you to give us update on the Executive Sales Forum International in case anyone is like, “Oh my gosh, I want to be good at this. I want to be able to wake up at three in the morning, have Steve just shake me and ask me a question about getting in the door, and I’ll know exactly what to say.” Tell us about this forum, why you came about, and what your expectations are for the actual organization. Steve: Let me ask you a question. Do you know Tony Hughes? Marylou: Very well. I love him. So I went along and it’s a peer advisory forum. It’s about 14 people there, there’s senior executives, CFOs, CEOs, and it was very good. They talk about each of those issues, they got to know each other, they had a guest speaker, and it was a pretty good session. We decided I wasn’t going to take over. They merged with someone else when Tony gave up. I thought it’s a really good idea but I could see some problems. One problem was it was in Central Sydney, so I had to get up early, I miss my morning gym session, find a parking spot which cost me a fortune, and by the time we met, had a session, had lunch, my entire day was gone. There was about four people that couldn’t make it for various reasons. They were interstate or they were too busy. I thought great concept having people in different industries and different levels talking to each other and helping each other, but it’s a big chunk in an executive’s time of day or month, and you’re limited to people in your city. I thought, wouldn’t it be great if we did the same sort of thing, but rather than do it face-to-face, we do it online and rather than do it just with people from your local city, we do it internationally? What we’ve done is we’re setting up an international peer advisory forum with a sales bent, the sales executives, CEOs, chief marketing officers, founders, half from North America, Canada, USA, potentially Latin America, and half from Australia and New Zealand. It will be 12 people, it will be senior executives, and they will get a regular and mostly peer advisory meeting. They’ll also get one-on-one executive coaching for me and my partner and a whole heap of other stuff, because I believe that senior executives, particularly sales-oriented people, they know their industry, they know their customers, they know their products and services, they know their problems, but everyone tends to do the same thing because we’re in a bubble. By expanding that perspective internationally and seeing what other people do in other industries, in other countries, they can learn new things, try new things, and maybe get an edge over their competitors by bringing in ideas from elsewhere. And that’s the idea Executive Sales Forum International is a group of senior executives that help each other get new ideas, that get executive coaching and that boost their companies, their sales, and their careers to a new level. Marylou: Wonderful. Well, Steve, thank you so much for coming on the podcast today. I will put all the information for those of you who would like to speak to Steve on his page. Is there a special place that you’d like us to reach you? Is it LinkedIn? Is it email? If so, give us an idea of where you’d like us to contact you. Steve: My LinkedIn profile has all of my contact details. The website, which isn’t quite finished yet but will be very soon, for the forum is execsalesforuminternational.com. I’m a great believer in descriptive website names. Marylou: And it’s all names that we know how to spell, hopefully. It’s always a big problem. Steve: […] be a problem. Marylou: Alright, Steve, well again, thank you so much. It’s a pleasure speaking with you. Steve: Thank you very much, Marylou. It’s a pleasure speaking with you, too. Oh, by the way, I should say, we have also in Executive Sales Forum International a panel of some of the leading sales bloggers, authors, and experts in the world as our executive panel. You’re on it. Marylou: Oh, my goodness. Lovely. Wonderful. Happy to be there. Have a great evening or it’s actually wait, it is early morning there, late evening here, so have a wonderful day today, Steve. Thanks again. Marylou: Okay, we’re a wrap. That was great. Thank you so much. This whole story thing is so important and I love the way you broke down the preparation steps of the hierarchy. First, you’re looking at the industry, then you’re looking at the companies within the industry, then the people within the companies, and then the person and the role and task they do. At the end of that is conversation pieces to use to get in the door. I love it. Steve: You asked some very challenging questions, which is good. Steve: The funny thing is that the most important part of the [00:41:40] is the open. Not the close, the open, and we’re giving that to the most junior inexperienced people. Marylou: Yes, it’s really funny when you say that because the cache is around the close. The opening of the door is not as highly thought of. This is US. I can’t speak for Australia but here, all of the professionals in the cache, as I said, is around getting to close. It’s not getting to prospecting. It’s not the first getting in the door. It’s not treated with the same dignity, I guess, as the other. I’m try to change that but it’s still very difficult here in the US. Steve: If you’re talking insurance, maybe that’s the case. But if you’re selling $100,000 or a million dollar thing, software, whatever it might be, you can’t get in to make that decision by a smart technique. Will you have one COMR too? What color would you like your CRM? Marylou: Right. I have a client right now that’s got pathologist and scientist who are in the bullseye in that center. It’s a disservice to try to reach out to them if in fact they don’t have the precursor set, the before call planning is what I call it. There’s steps upon steps upon steps of preparing for these types of calls. They’re not asking for the referral down. They’re asking for time on the calendar with the pathologist, with the scientist. It’s a difficult conversation to begin with because of the persona but we’re seeing that it’s probably a better idea to offload some of those larger accounts to the account executive and have them prospect into those strategic accounts, with the SDR side-by-side, shoulder-to-shoulder, so they can listen to the dialogue, understand the business use cases first, and then [weave 00:43:43] those into stories and have the AE be involved with that. When we tag-team them, it seems to be better. When they go on joint calls, whether it’s virtual or video, it seems to work a lot better. We’re kind of getting back to the daily coaching, role playing, and doing a lot more prep work and planning work before we actually initiate phone calls and emails even. Steve: That’s the way it used to be done back in the middle ages. I started my post-university career as a medical rep, selling pharmaceuticals to Merck. Marylou: Oh wow. You were a pharmaceutical rep. That’s a hard, hard job. Steve: Well, it was different back then. We should take people [00:44:38] and drive them. But when I joined, we spent six weeks in a classroom learning, and we didn’t learn about the drugs. We learned about the conditions. I could talked blood pressure and hypertension and arthritis and things like that. Obviously, I could talk about the drugs, too. Then, when we finished six weeks of training about medical terminology, hypertension, arthritis, depression, and about the drugs, I then spent the next six months working with an experienced rep going around the doctors [00:45:18]. At the end of that, I could talk to doctors on their terms, in their language, about the conditions that they treated. Marylou: That’s the way it should be and I think maybe what’s happening here, especially in the tech community is we have the venture capitalists, we have people who are funding these ventures, who don’t understand the market, don’t understand the industry, don’t understand the time it takes to ramp. I’m constantly fighting against that. “What did you do for me lately? Why are we getting our opportunities now?” Well, there’s a ramp here. It’s definitely a crawl-walk-run situation. We’re not going to hit the ground running just because we have tools. People think because we have tools now, we can just hit more people and then watch the inbound increase and the meeting go up because we’re talking to more people who are leveraging technology. But what I’m trying to fight against, if the sales conversation is not there to begin with, it doesn’t matter if you send one, a thousand, hundred thousand emails. No one is going to respond. Steve: Again, the question is, how many of your emails do you respond to? How many sales emails do you get? When did you last buy anything based upon a sales email you got? Steve: And then why should yours work? Marylou: Yes, exactly. Well, this has been a pleasure. Thank you so much for your time. I think it’s going to take a couple of weeks to get this pulled together and I’ll let you know when it’s ready to go. In the meantime, there’s a particular headshot or anything else you want to send to me that I can put on your page, to introduce you, your work, what you’re doing, please feel free to send me the email with that and we’ll make sure we’ll incorporate it into the actual page. Steve: I’ve just sent you an email with two things: a headshot which looks nothing like me but that’s okay, and also I’ve sent you a link to an article called Why Sales Development Reps Maybe Burning Your Cash. Marylou: Oh lovely. Could you also send me the link to the one about the prospects that you mentioned on the call? Or can I find it pretty easily on your LinkedIn? Steve: Yeah. It’s on my profile. It’s got a big monster thing on it. Marylou: Okay, I’ll find it then. Steve: The Terrible Truth About Your Prospects. [00:47:41] it was by my friend [John Bedwani 00:47:43]. I actually wrote it for him but he’d be worth interviewing. He’s developed what he calls authentic relationship management. It’s basically the same thing we’re talking about. Marylou: Lovely. Would you mind introducing us? I would love to interview him for the podcast. Steve: Very happy to introduce you. He’s very dynamic. He’s very passionate. Marylou: Oh good. We all are. Wonderful. Well, thanks again, Steve. Have a wonderful day today and I look forward to getting those files and we’ll get you all set-up. I’m sure the audience is going to absolutely love this conversation. Really appreciate it. Steve: Lovely to talk with you, Marylou.